the following doesn't happen to anyone but me: best. night. ever. The day started off with seeing friends, eating cinnamon rolls and general fun 'n' games. 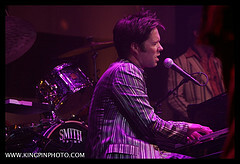 Now I'm sitting here listening to Rufus Wainwright live in concert at the Gramercy Theater in NYC courtesy of NPR and the lovely peeps at WNYC. I really should spring for computer speakers; the one on the Mac Mini does not cut it. RW is a lyricist in the old-fashioned sense - words structured in such a way that he says things quite plainly, but it hits you a second or two after you hear the line. He is heavily influenced by all that opera to which he listened between the ages of 14 and 24 [I think that's right], and that was it. No rock, no jazz, no folk. Just opera. Not only can he write circles around most, he sings with a whole lot of moxie and grace. I can die happy right now.